The Houston Cougars sit at a record of 19-1 as March Madness approaches. While this is a veteran squad, depth has been the ingredient to success so far. The Cougars are enjoying a very successful campaign in the American Athletic Conference. With a record of 19-1, this team is definitely on pace for a spot in the big dance. However, what exactly is leading to this amazing start? While the numbers don’t look that impressive, they matter a lot for a team like the Cougars. As a matter of fact, this display of basketball is somewhat rare in today’s college game. However, the numbers don’t tell the full story. Indeed, this team plays great team ball. Defensively they play decently. 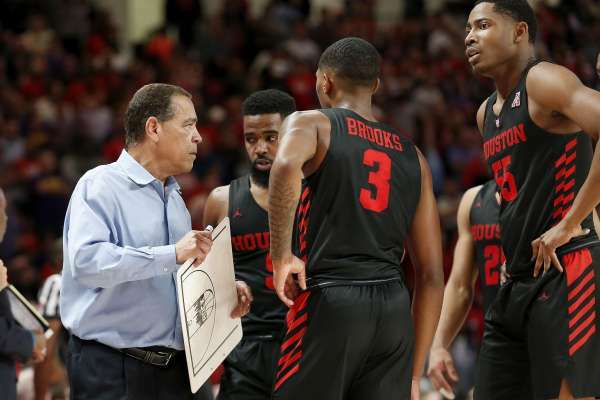 However, let’s remember who’s coaching this squad, Kelvin Sampson. Sound familiar? He was once an assistant on the Houston Rockets staff under Kevin McHale. With his recruiting ability, Sampson has assembled a really well-rounded team. In fact, Sampson has gotten the best out of his depth. This is due to the balance in class his team possesses. The Cougars have a great balance of youth and veteran players to answer the call in any situation. Did I mention Sampson is a former Rockets assistant? It would be a shame if his team didn’t perform decently offensively. Here are some more stats from the Cougars this year. While these numbers all have translated to team success, there are some drawbacks. However, the biggest one standing out is not their fault. Indeed, having a 19-1 record as March Madness nears is outstanding. But, the competition from the AAC pails in comparison to other conferences. Especially conferences like the SEC, ACC, and Big 10, and PAC-12. Unfortunately, this team is not just going to qualify for the tournament. In all likelihood, they will have to win their conference tournament and even then they’ll have competition for that spot. But given the way they’re playing right now, there is no doubt this team will be there. One thing that has made this team great is the way they have won games this year. They play tough and never give up. Or how about their most recent win over East Carolina? Hit 16 three-pointers and your squad would probably win too. And if that isn’t believable. Listen to this. The Cougars rank second in the nation in field goal percentage defense, third in three-point field goal percentage defense, and finally, eighth in scoring defense. With that kind of defensive efficiency, scoring ability, and roster depth, beware. The Cougars are looking to make some serious noise in March. Which, indeed, will make them a tough out for anyone to deal with. No. 17 Houston travels to Tulsa for a matchup on Sunday. The Cougars are currently tied with Cincinnati with a 6-1 conference record. See you at the dance, Cougars. Stay tuned as March Madness approaches. Indeed, it should be a good one.